First of all, we are sharing our lovely pumpkin Thank you Nellie for my pumpkin! And now for this week's Caturday Art. Not a Halloween theme this week as we think we've overdone those, so instead we used SuperPhoto app again. I was at the window gazing out at the bright sun and Mum took this photo on her iPhone. I love my reflection in it. You may have also noticed that we are now using Linky Tools for our hop. After last week's post, in which saw Mum having one of her panics about money again and saying she wasn't prepared to pay what the other link up was charging for subscription, she had a good think about it and decided to try Linky Tools instead. It is slightly cheaper and so she thinks it's more affordable for her. It's the most popular link up tool for bloggers anyway. Like to draw or paint animal pictures by hand instead? Then share these too! Very cool art this week, Athena! I'm glad your human got the linky problem figured out. Athena, wes would bes here any way! Wes LOVES your blog hop - ALMOST as much as wes LOVES yous! Yous is one gorgeous kitty and your Mmmy makes such beauteous pictures of yous! Lots of Kisses to yous and your Mommy! Those eyes!!! That effect is stunning. I'd never heard of SuperPhoto before ... but I'm checking it out! Nice pumpkin and I love your art. This is one of my favorites. We love your blog hop! Great job this weekend! That is beautiful! I'm always trying to get a reflection effect when I catch one of the cats napping in a window, but it rarely comes out the way I want it to. This is gorgeous art, Athena! You always take a stunning photo, and then somehow make it even more stunning with you artistic talent. Purrs! That Super Photo App really enhances your beautiful stripes, Athena. Our human is SOooo glad you changed to this linky so we can savor everyone's pic up front! Have a great weekend. You are a regular iPhone model now, Athena. I quit having link ups because of the cost of that other tool. I forgot about Linky tools! Athena you are always beautiful!! Nellie's pumpkins are super! 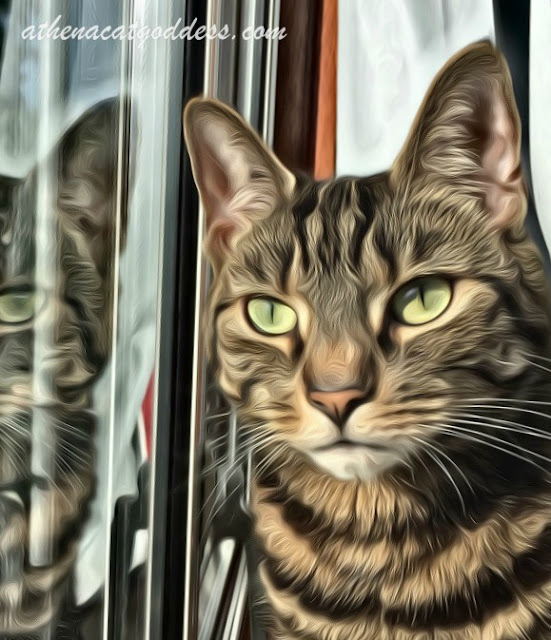 We love that photo...it's great how your Mom captured your reflection. Athena, that pumpkin from Nellie is terrific, and we love your Super Photo artwork. So pretty! Great art! I finally decided to do Halloween art today. Too bad that other linky tool is too expensive. I liked that it filled everything in for me. MOL! Frodo loves the art you used today-can you tell us what it is! Athena looks beautiful!! I'm too late for your linky list, but here is my link anyway!!! 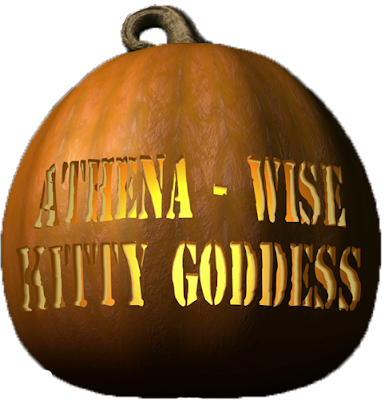 by the way, I love your art, Athena! !